I didn't do any thrifty or vintage shopping this week, but I did add a treasure to my collection nevertheless. I received a package in the mail this week from my very kind cousin Mary who lives in Texas. She blogs her groovy perspective on the world over at Babylon Sisters. She also handmakes incredible bohemian gypsy curtains, which she sells via her Etsy shop. Her curtains have appeared on the TV show Sleepy Hollow. Mary and I grew up nowhere near each other and yet we have so much in common, including being committed vegetarians. Mary sent handcrafted tote bags for me and my sister. The totes are made from antique quilt pieces created by our grandmother (my dad's mom). I have lots of quilts, dishes and linens from Mom's mother, but little from my dad's mother. 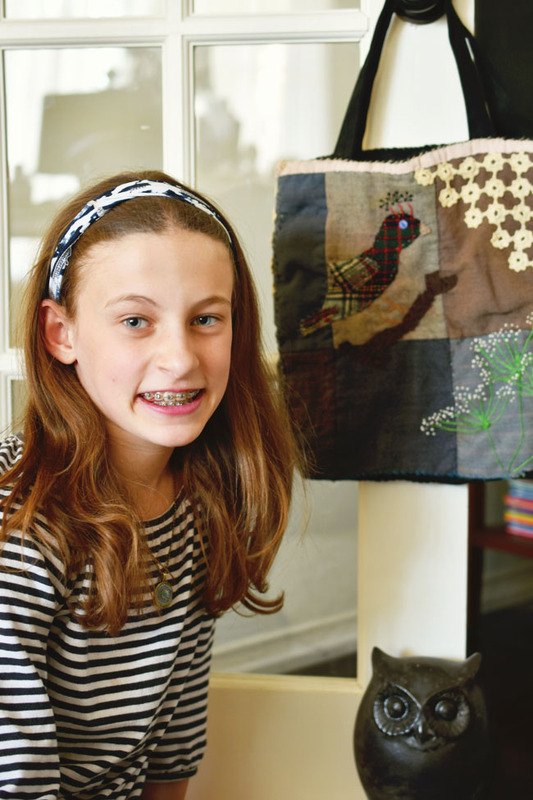 The quilts were in bad shape so Mary smartly turned them into these lovely (and useful!) keepsakes. While I was taking pictures of the totes the other girls in this house wanted to get in on the action - first my daughter (top) and then Jolene the beagle mix. Jolene actually lay down in front of my little vignette and refused to move. See her blurry head, above. Anyhow, this is the front of tote bag #1. I love the plaid bird (we are MacDonalds after all), the lace detail and the plant life. 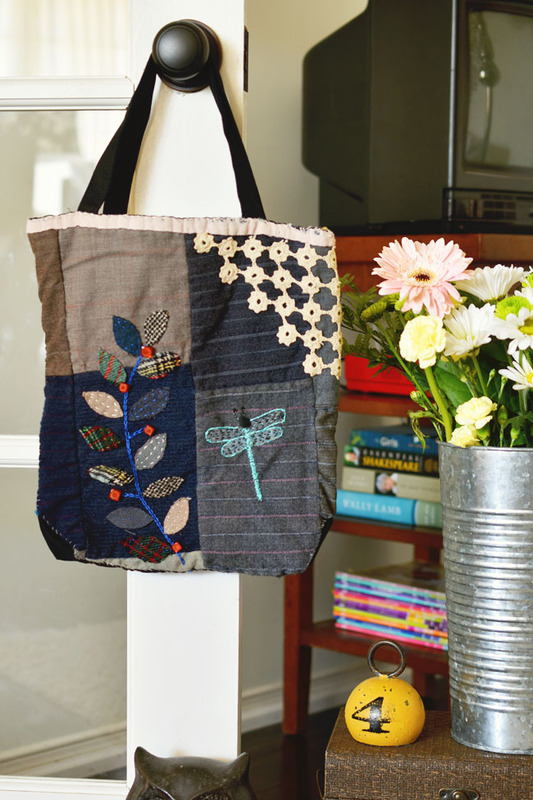 The back of tote bag #1 has a cute dragonfly and a leafy plant with beads. The front of tote bag #2 has three sweet birds. The back of this tote has a steaming cup of tea and a flower (with a cute button centre) in a vase. 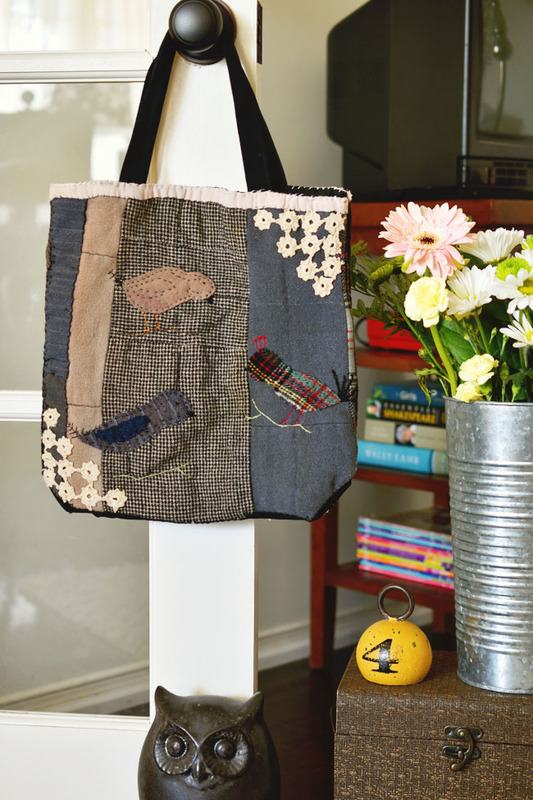 My sister will be getting one of these tote bags and I know she and I will cherish them, because they have pieces of our grandmother's quilt and because they were made with love by our cousin. Thanks Mary! 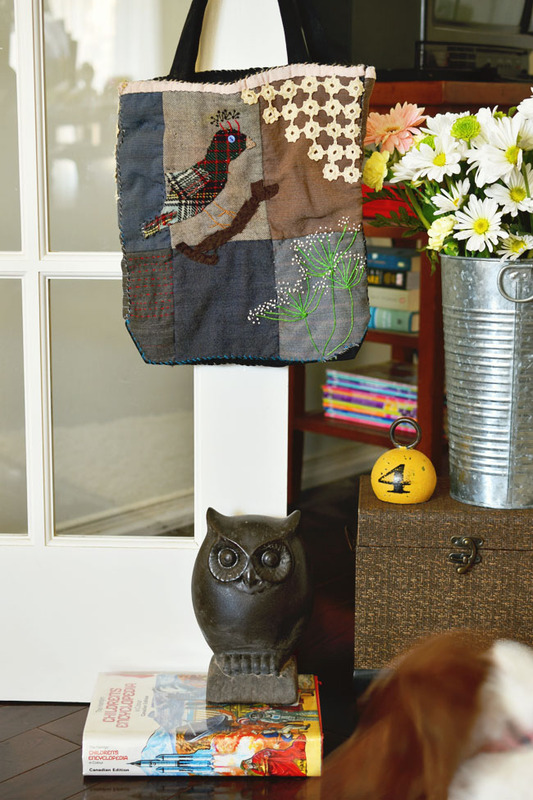 Do you collect vintage quilts? Have you made anything from them? 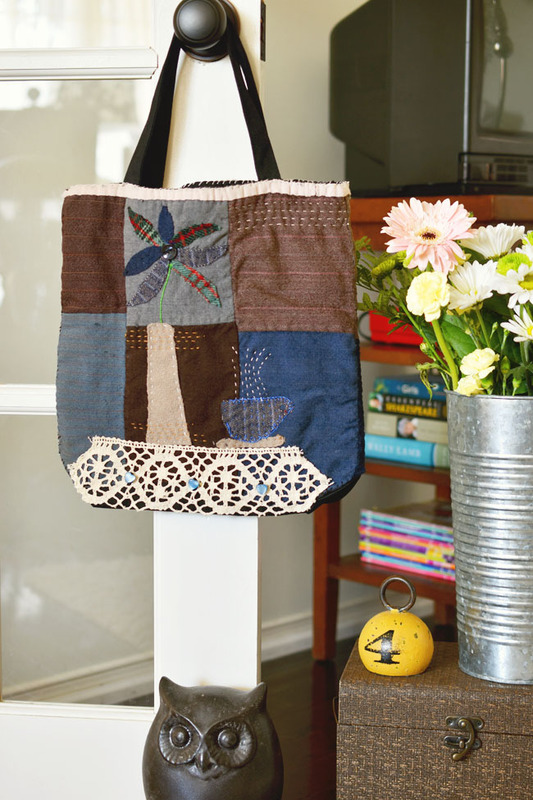 Hi Joann, what a wonderful gift, a tote/purse make from your Dad's Mom's Quilt Pieces. Treasures. You're so welcome! Look at that sweet girl with her braces! Aurora is nearly ready for hers too! Those tote bags are a true treasure!